Emotional Intelligence and Leadership Coaching is for the experienced coach. There is a remarkably high correlation between high emotional intelligence and success. We'll study how leaders can become more aware of their own emotions and those of others, as well as how to manage their own emotions and respond effectively to those of others.Leaders, whether they are executives, managers, business owners, teachers, parents, or even coaches; need high emotional intelligence, because the performance of those they lead depends on their ability navigating their feelings and inspire their best work . Virtually everyone is a leader sometime. This course is designed for the more advanced coach who coaches around leadership. It integrates research into emotional intelligence with related fields, such as positive psychology and appreciative inquiry, and integrates them into effectively coaching. Participants will come away with an understanding of emotional intelligence applied to coaching leaders. Successful completion of the course will bring confidence, understanding, new skills and applications, as well as a certificate of completion and eight ICF credit hours. Where positive psychology and emotional intelligence overlap. The dynamic between Positive Emotional Attractors (PEA) and Negative Emotional Attractors (NEA). Why only coaching around positivity can be disastrous for your clients. What parts of the brain and other human information processing systems are activated during positivity and negativity. How resonance is created in relationships. How to leverage negativity for even better coaching outcomes. Why leaders need emotional intelligence even more than most. This is an advanced course perfect for graduates of the ICF Approved Certified Positive Psychology Coach Program and we are getting approval for 8 ICF Continuing Coach Education credtis. Your live, interactive webinar classes, which you can take from anywhere in the world, will introduce you to the research, theories, assessments and tools used in coaching with neuroscience. Who is Emotional Intelligence and Leadership Coaching for? If you’re an experienced coach who wants professional training, Emotional Intelligence and Leadership Coaching is for you. If you've an ICF credentialed coach, earn 8 ICF CCE's and a certificate of completion. If you're a high-achiever, and/or an ICF PCC or IAC MMC, the Master Certified Positive Psychology Coach program may be perfect for you. 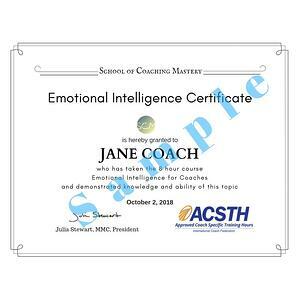 Finally, if you're a great coach, you're probably curious about the coaching with emotional intelligence and what it can do for your clients. This is your perfect opportunity to find out. 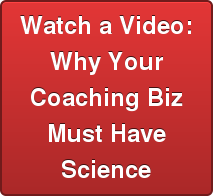 How is Introduction to Coaching with Neuroscience delivered? * Interative webinars allow us to do everything in a virtual class that we can do with a live classroom, except shake hands or get stuck in traffic. Now you can learn in your own style in this money-saving, time-saving, hassle-saving format. You do NOT have to incur long-distance charges or call an international telephone number! And you do not have to go online to participate. Distance learning has never been easier nor more economical. Normally, there is an extra $100 charge to get your Coaching with Neuroscience Certificate, but we're currently waving that fee, so you save $100, if you register for the upcoming course! Best of all, you'll have skills and tools that are proven to work, so you can create the life and business you really want! How can you earn a Emotional Intelligence Certificate? And you will be awarded your Emotional Intelligence Certificate! When is Emotional Intelligence and Leadership Coaching offered next? You’ll be able to qualify for your prestigious Emotional Intelligence Certificate within weeks! you really want. All our programs come with our Value Back Guarantee. That means if we don't give you the value you expect, tell us as soon as possible and we'll make it right, period.